If you ask in the G+ community about review copies for White Star material, you can be sure that people will be willing to help you out. The great thing about White Star is that it has lots of 3rd-party products (thanks to the OGL?) and thankfully these are also very cheap, mostly between one to three bucks. I recently heard a critic that people publish material for money whereas some time ago old school fan material was published for free. I don't agree. It really depends on the product. Some material is not so good (not playtested etc.) and would be better off if it was free, but some products are really high quality and worth the 1 or 2 dollar you need to spend. Furthermore, you don't really need more stuff for White Star but it's nice to have. I have a list of White Star material HERE. 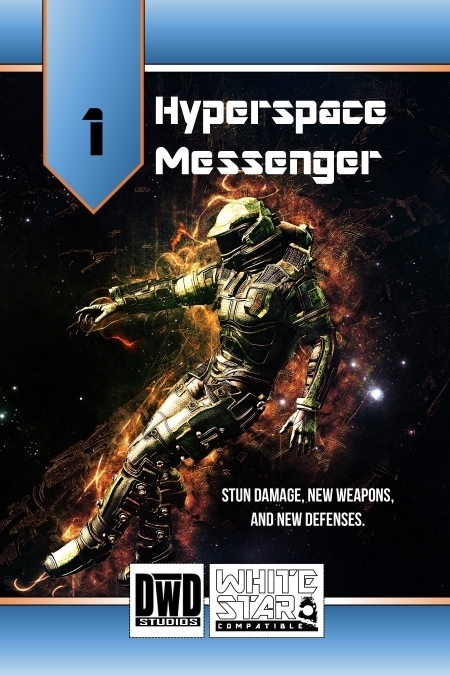 So, today's topic is issue 1 -3 of Hyperspace Messenger by Bill Logan. 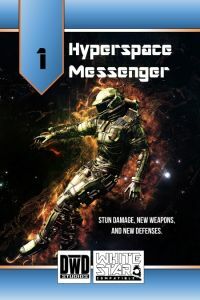 Hyperspace Messenger is a semi-regular small supplement. Every issue costs USD $ 1.00. Get Issue 1 - Stunners HERE (aff). 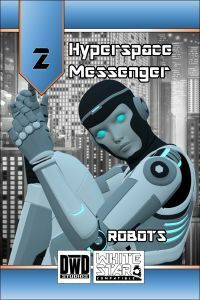 Get Issue 2 - Robots HERE (aff). Get Issue 3 - Aliens HERE (aff). The PDF is 10 pages with 6 pages of actual content (the rest is cover, OGL etc.). The premier issue deals with stun damage, new weapons and new defenses. I like what I see in here. Stun doesn't cause hit point damage, instead you need to make a Saving Throw. If the victim fails, he'll be unconscious. I like how easy and neat this mechanic is, it's painless to implement into your White Star game. There are some ideas about ST modifiers and different stun types (electrical stun and sonic stun). The short supplement includes six new weapons, for example, the Electro-Stunner or the Stunnades (stun grenades). Furthermore, there are two new defenses, the Harmonic Armor, and an Electro-Shunt Implant. The writing is clear and precise, the layout and font are no-frills and easy to read. There are really great black and white illustrations of the new items. All in all, a very nice add-on for your game. The price of USD $ 1.00 is ok although I wish for a tad more content than six pages. Here you'll get more bang for your buck, the page count goes up to 16 with 12 pages of actual content, so double the size of issue 1. 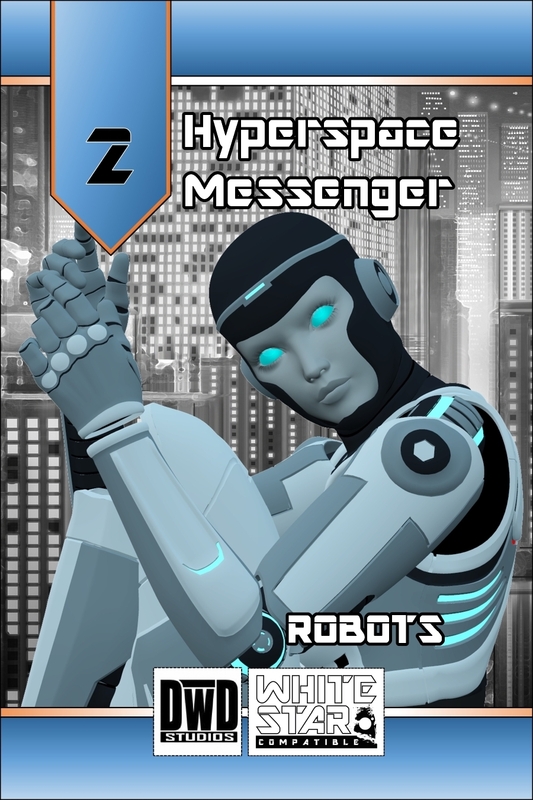 This issue looks at robots at detail and is mostly useful for the GM to create NPCs. White Star provides some guidelines for PC robots, but this supplement gives you a lot more information about other types of robots. The author explains a list of standard immunities like dehydration or mind control (robots don't need to drink and can't be mind-controlled with Gifts or Meditations). Then there is a list of equipment and advanced equipment. The meat of the show is the 9 different robot types: from Astro-tech Bots to War Bots. These cover a wide range and provide great utility. For example, I can instantly see use for Security Bots which come in three variants: Civilian-Grade, Security-Grade or Military-Grade. Protocol and Astro-tech Bots are the standard staple for Star-Wars-themed games. But also Seeker Bots or Medical Bots might be interesting for your campaign. Visually, the supplement is also nicely put together: every new Bot has an illustration. Overall, this is a very good supplement and totally recommended if you're interested in robots. This is a totally fun supplement: it allows you to create random alien races! I really love the idea because randomness is a large part of old school gaming, at least for me. 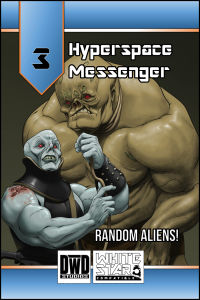 While the result may not a totally balanced new race, it's definitely an amusing way to roll up a new alien race. Mr. Logan took some balancing issues into consideration, but it's mostly a rough estimate. Nonetheless, if you have lots of special abilities, the XP requirements for leveling up are much higher and your max level is capped earlier. Tables to roll on include things like native conditions, mode of transport (i.e. slither or crawl), senses, reproduction (i.e. cellular division or self-fertilizing egg), special abilities (battle rage, depth sense etc.) and many more. There are examples of complete races included, so that's a nice addon. Like the previous supplements, this is a visually clear looking product with pretty illustrations. It's a great steal for USD $1.00 and a lot of fun. If you want some more diversity in your game, Issue 3 adds a nice template for new races. Additionally, you could use this framework as a base to create your own classes, too. While none of these products are really necessary to enjoy a White Star game, they add some fine value. The production quality is pretty high with a straight-forward layout, interesting ideas, and great illustrations. I'm pretty impressed with Hyperspace Messenger. Bill Logan clearly has a passion for this game. While writing this review, Issue 4 - Skills was released and I'm positive that it is also a good supplement.